The Stunmai II is a 36' Harris, powered by a Cummins diesel. She has a full array of electronics, as well as all required safety equipment. The Stunmai II is an ideal fishing platform for both the experienced angler and the novice alike. With a maximum of 6 passengers, there is plenty of room for everyone. 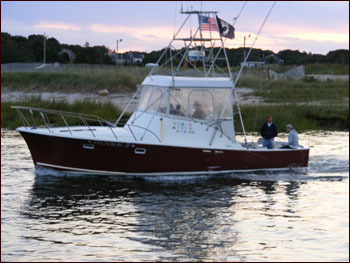 The Stunmai II features rod and reel combinations that are tailored to the type of fishing that is productive in Cape Cod Bay. As well as a full compliment of standard tackle, the Stunmai II carries an extensive selection of light tackle that can be handled by the younger anglers, and is also more of a challenge to the experienced angler. Remember, the Stunmai II fishes out of Rock Harbor, in Orleans. Rock Harbor is a tidal harbor, so sailing times are dictated by the tides. Click here for the scheduled sailing times of the days you are interested in. For up to date news, pictures, and reports of what is happening on Cape Cod Bay, follow Capt Hap on his "Rock Harbor Bandits" Facebook page.